Keeping an Eye On Which Prize? Every state is obsessed with maintaining or creating a “good business climate.” I think NH has traditionally had a good business climate, with both the public and policymakers demonstrating a high regard for businesses, and with a climate of mutual respect between the business community and state policymakers. At times they have differed in their views, and the balance of interests could change marginally from time to time, but over the years there was a nice balance where each was able to ultimately rely on one another to increase opportunities and prosperity in the state. There is a lot of fretting over the business climate in the state and what it means for our ability to “attract” businesses. That is always a good thing to monitor, but I am concerned that we (business people, policy makers, citizens) may be spending too little time concerned with creating a climate that is attractive to individuals. More specifically, skilled individuals with higher levels of educational attainment that increasingly are the source of competitive economic advantage in states and regions. The in-migration of individuals with higher levels of educational attainment fueled NH’s economy and increased the concentration of technology and higher-skill industries and occupations during much of the past few decades, just as it has in other states that have been able to successfully attract skilled, well-educated individuals. The chart below shows how the educational attainment of NH residents differs between those who were born and continue to live in NH, and those who live in NH but where born in another state (in a future post I will discuss international migrants). 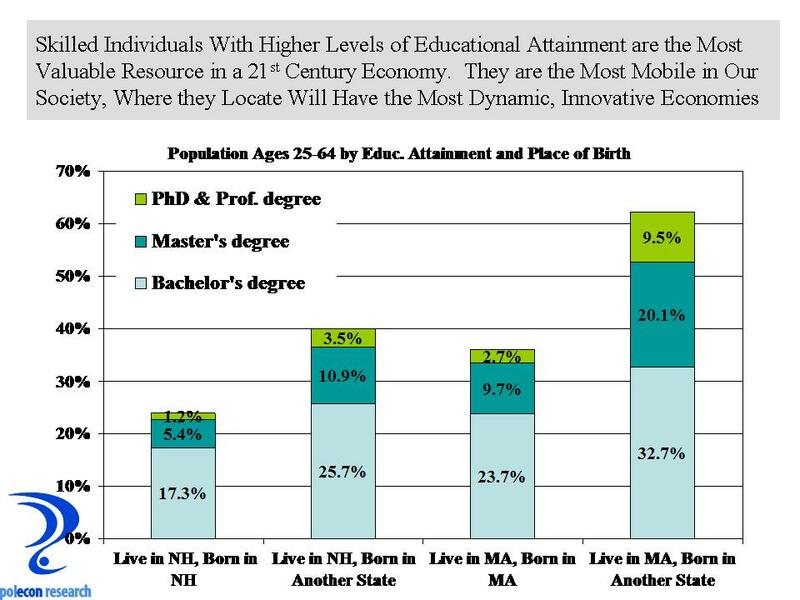 The chart shows that residents who have moved to NH from another state are much more likely to have a bachelor’s or higher educational degree. NH regularly loses its natives with higher-levels of educational attainment to others states, just as other states lose those individuals. Individuals with higher-levels of educational attainment are the most mobile in society. They have the most opportunities and generally resources that afford them more choices on where to locate. That means that the native population will often show overall levels of educational attainment lower than in-migrants from other states. In-migrants to MA also have much higher overall levels of educational attainment than natives who live in the state, but the native population that was born and lives in MA has higher levels of educational attainment than the native population in NH. In fact, educational attainment among those who where born and live in MA looks a lot like the in-migrant population of NH, not surprising since about 300,000 individuals born in MA now reside in NH. In-migration to NH has been slowing and recently stopped, with tremendous implications for our economy’s ability to grow, innovate, and remain dynamic. Lets keep our eye on maintaining a good business climate (we can start by reinforcing our tradition of mutual respect between business and government), but I think we need to quickly begin asking ourselves if a singular concern about business climate is sufficient to assure growth in our economy if NH is losing its attractiveness to the individuals who are increasingly the source of its economic strength. This entry was posted on October 26, 2012 at 12:26 pm and is filed under Demographics, Educational Attainment, migration. You can subscribe via RSS 2.0 feed to this post's comments.